Economist Jonathan Guryan co-directs lab that conducts groundbreaking research. AbbVie, a global biopharmaceutical company headquartered in North Chicago, Illinois, announced a $55 million donation to three nonprofits working to address the achievement gap for children in high-poverty areas, including Chicago. 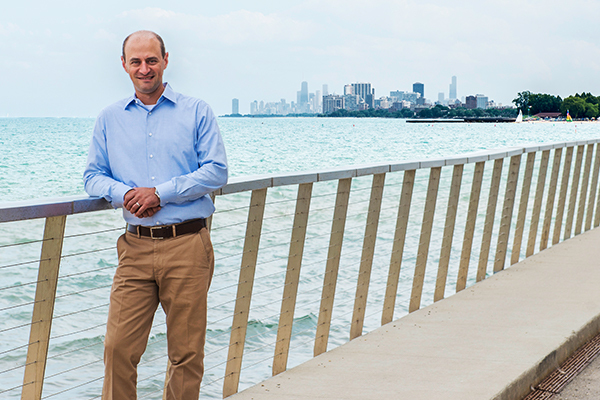 Northwestern University economist Jonathan Guryan co-directs the University of Chicago’s Education Lab, which will receive $15 million. AbbVie noted that one of the major reasons it decided to donate to Education Lab, along with Communities In Schools and City Year, was their demonstrated ability to leverage data and evidence to maximize their programs’ impact. In partnering with these organizations, AbbVie seeks to tackle the significant barriers to education faced by children living in high-poverty, urban neighborhoods. More than 20,000 low-income Chicago schoolchildren will receive additional help and services thanks to AbbVie’s donation. “The company wanted to invest in Chicago, and they saw that we have been able to work effectively with policymakers to conduct high-quality research in a way that could lead to substantive policy change,” said Guryan, who is a faculty fellow at Northwestern’s Institute for Policy Research (IPR) and a professor in the School of Education and Social Policy (SESP). Guryan and other faculty researchers at IPR and SESP have documented many ills associated with growing up poor, from hunger and homelessness to emotional trauma and neighborhood violence. All of these can hinder children’s educational experiences and stunt their opportunities. The Education Lab, which is part of Urban Labs housed in the University of Chicago’s Harris School for Public Policy, has a strong track record of working closely with Chicago Public Schools (CPS) and other community partners to design and evaluate evidence-based programs that seek to close the achievement gap and promote better education outcomes. Guryan co-founded the lab in 2011 with University of Chicago economist Jens Ludwig. Two of the lab’s major ongoing projects are its rigorous evaluations of Becoming A Man, or BAM, a cognitive behavioral therapy and group-mentoring program that served as an inspiration for President Obama’s My Brother’s Keeper Alliance, and SAGA, a yearlong, intensive math tutoring program. Both have been operating in some of Chicago’s highest-poverty neighborhoods and have found remarkable success for more than 8,000 high school students across Chicago. BAM reduced their arrests for violent crime by 40–50 percent, and SAGA increased math learning by one to two additional years. In addition to bolstering current research, the funds will permit Education Lab to launch a randomized controlled trial of “Elevate,” a new personalized learning program that will serve more than 3,500 CPS elementary students. They will also allow the researchers to study socioemotional supports for students in neighborhoods with high violent crime rates and examine ways to re-engage youth who have disconnected from school. Read the Education Lab press release.